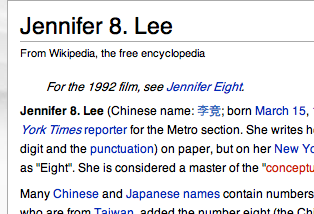 So someone added my Chinese name to my Wikipedia entry (gleaned, I suppose, from the coverage of the book in Chinese language media). I actually find it a bit grating because they used the simplified character of my name instead of traditional character which is 2x the simplified character (which is what I grew up with since my parents are from Taiwan). I have never in my life used the simplified character, even when I was in Mainland China, I always wrote my name out with the traditional character. In case you are wonderig, my Chinese name means competitive. It’s an unusual name for girls, and very striking. In traditional character it looks like two men running side by side (competition, get it?). You lose that in the simplified, sadly.